You know that usually my favourite thing to design is clothing. Originally I saw this perfectly lovely bird mobile made of wood, painted in exotic colours and I thought it was gorgeous and wondered how I could create the essence of this in crochet. Later, when I was a long, long way from home I saw a bird doorstop in Helsinki, Finland and I knew it had to come to my place to live. He was tiny. He would fit in my luggage. Then one day when I had a major deadline looming the challenge of creating a bird came to mind. I’ve never had a deep desire to create a bird until then. Although I had made an Easter Chicken somewhere along the line hadn’t I? How different would a bird be from my chicken I wondered? So the creative process began. And my birdie was hatched. One week after creating my dear little birdie “Bobin” with the exotic plumage provided by Noro Taiyo yarn www.knittingfever.com, www.prestigeyarns.com, I took him for a drive in my crochet bag to show my friend who loves all things crochet. We were both in Brisbane to attend the www.craftfair.com.au. I was feeling a little foolish and hoped she loved him as much as I did. And she did. Her reaction was perfect. The universe is quirky so imagine how surprised I was when the next week the organisers of the same craft fair announced that they were running a birdie competition in any medium. Was this a sign I wondered, was that why I put off my pressing deadline to just create this little bird? I sent my bird off to Sydney all on his own. Bobin didn’t win the competition but he was selected as a runner up. And now he gets to fly all over Australia and New Zealand. No one can get to see him unless they visit the www.craftfair.com.au so in my mind he is a winner. Please go to say hello to him if you are going. Sometimes the challenge of creating a thing of beauty is what drives we crocheters on. I see this pattern made up as a baby toy, or made tiny in fine cotton perhaps in Omega Armonia from www.creativeyarnsource.com with lots of friend as a mobile. Or as a birdie baby bunting in the bright colours of Biggan www.biggandesign.com. Or made with Hoooked ribbon XL www.zpagetti.com.au stuffed and weighted as a doorstop. 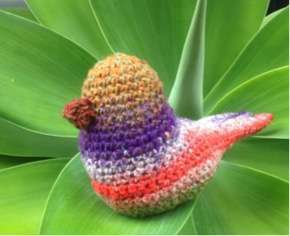 I have made this pattern free to celebrate the last day of Crochetville’s crochet month celebration. If you make him up I would love to see your photos.